Contemporary yet classic Coffee Chain fashioned in Sterling Silver is of great quality. 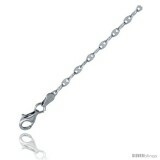 This Very Thin, Very Light Box Chain is probably the most popular type of pendant chain. 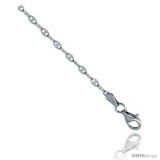 It is Solid Silver Italian Made, and It Is less than 1/32" (1.0 mm) Thick. Strong and flexible. And as in all our chains it is NICKEL FREE so its Hypoallergenic .